The ‘Juliet’ cherry has the most enticing-looking fruit on it right now and I needed to come up with something to use it in. The fruits are just a little too sour to eat fresh (although with whipped cream or frozen yogurt they would be delicious.) And I was going to a barbeque yesterday so I decided to do something uncharacteristic and bake. Then I boasted about how I baked something with the cherries from my tree, basically getting all the gardening cred possible. I made this Sour Cherry Crumb Cake (recipe from Martha Stewart). I was nervous about it. I am not a great baker, and I have a tendency to overestimate how good I am going to be at baking things. That’s a bad combination. I once tried to make cookies with fresh-roasted hazelnuts in them, which I roasted myself. It took hours and ended in tears, and the cookies were not that great, you guys. Anyways, in spite of containing the words “offset spatula,” this recipe wasn’t heard to make and it turned out great. (I just used a regular spatula.) 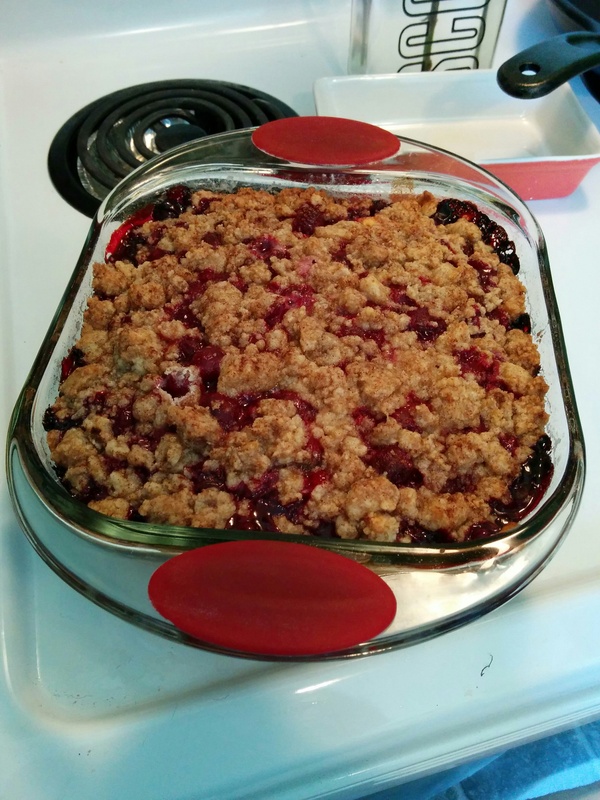 The trickiest part was probably pitting the cherries, which I left to my husband, figuring (correctly) that it would involve some pounding or making a mess, which are aspects of cooking he enjoys. He googled “how to pit cherries” and Lifehacker told him to put the cherries under a piece of parchment paper and pound them with a mallet. (We used a rolling pin.) This worked pretty well, and it took him less time to pit the cherries (about a pound of them) this way than it did for me to get the rest of the cake ready. Result: Pretty delicious! Six out of six friends who ate it while playing Sushi Go! enjoyed it, and we ate the whole thing. I liked that it was not too sweet, and the cake itself doesn’t have a strong taste, so the cherries’ flavour really stands out. Also, please note, I tried to “style” this photo to make it look fancier and to make my kitchen look nicer, but then you couldn’t really see the cake, so let’s just leave it at this, shall we? A lifestyle blogger I am not. I do have a twee vintage “SCOTCH” bottle with a flower in it just out of the frame, but you’ll have to take my word for it.